So when it arrived in the mail not only did I want to take advantage of my brother’s amazing apartment complex, but also have some fun in the pool myself! Yoko likes dipping her feet in the water! It’s a great way to cool off in these hot summer months! Oh yes the water is so nice and cool! Yoko so sweet helping out her cousin Suika. 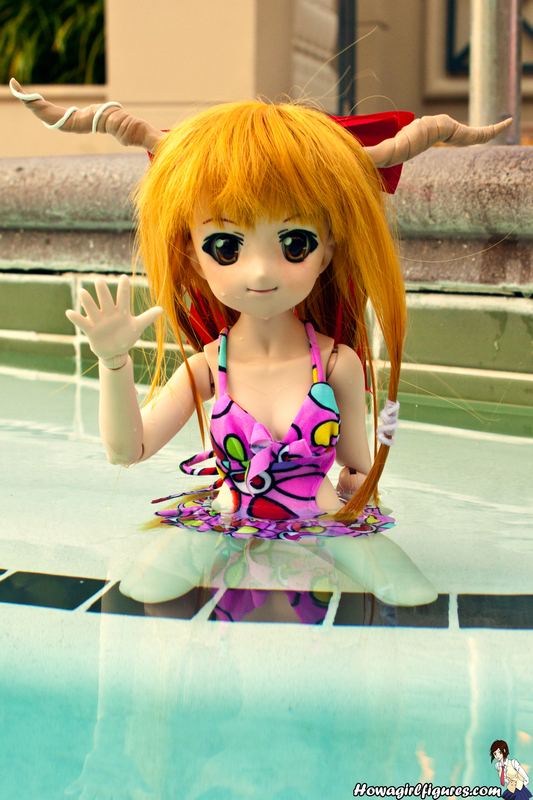 Suika’s sweet swimsuit is from Dollmore and looks so sweet on her! After taking a dip in the pool the girls relax on a towel and soak up some sun! Hope you liked my pictures, we’ll be hanging out again later at my brother’s place taking pics with our girls another day since there are so many pretty places! Regarding the swimsuits, the coolcats one is awesome in how it’s a 3 piece and you can remove the skirt. I thought it was attached but to find out it’s a three piece was nice. I don’t know about staining since I didn’t leave it on her for long. I doubt Suika’s swimsuit will stain since my brother had it on her for a week and that it didn’t stain her. YOU PUT THEM IN THE WATER? I’ve never seen that before, lol! The one picture of Suika in the water is absolutly adorable!!!!!! Kawaiii!!!! She’s so cute. I want this doll. Dollfie Suika! D: Want, want want! Where’d he get her horns from? wonderful pictures you take.I to am a grand figure photographer and I say your photos are out standing =) One thing I must ask did you put them in real water? or is it Photoshopped? Man do I want a Dollfie Dream.